Alabama is back in the #2 spot in the AP rankings this week. Coming off a 27-11 victory over Penn State, Alabama rose from #3 over LSU, who had leapfrogged Bama last week. 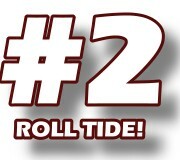 Alabama remains #2 in the USA Today coaches' poll. Oklahoma remained at the top of the AP despite a bye week on the schedule. They have a big game coming up next week against Florida State that could prove to shake the rankings up once again. Jimbo Fisher has his team at Florida State playing good football and with a nice stockpile of talent. I could easily see the Noles knocking off the #1 Sooners. #4 Boise State is holding steady but did grab 2 two first-place votes. They are going to once again be the fly in the ointment when it comes to the national title game if 2 or more of the top teams lose. Boise State should go into cruise control through their easy schedule for the rest of the year. They are decent and they beat Georgia, but what does that really tell you? Georgia was a pitiful 6-7 last year and Richt's job security is looking shakier by the day as they are 0-2 this year. Reigning national champions, Auburn, rejoined the top 25 by rising to 21 in a tough last second win over Mississippi State.